Would You Wear A Stainless Steel Engagement Ring? Stainless steel has long been the go-to choice for appliances and cutlery, but for jewelry? Industrial-strength stainless steel engagement rings have entered their market as a unique, modern alternative to traditional gold. While stainless steel’s composition varies, one feature always remains the same: it never tarnishes! The metal never needs to be polished and is extremely durable—it is, after all, used in household appliances and our serving ware. The industrial strength means it can take the typical wear and tear of a busy lifestyle and is the ultimate low-maintenance choice. Stainless steel’s best feature, though? Price. Stainless steel is the ultimate budget-friendly metal. You can craft a simple band for under $50. Like every metal, there are a few downsides to using stainless steel. As the composition of stainless steel varies, nickel may be found in the mix. So individuals who have a known allergy to nickel may need to inquire with a jeweler about the particular mix of metal. And stainless steel can show wear from impacts—meaning dents in the metal. Styling a stainless steel engagement ring depends on personal style preferences. While many jewelers don’t use stainless steel to set larger-carat diamonds, there is no rule that states that diamonds cannot be set within stainless steel. 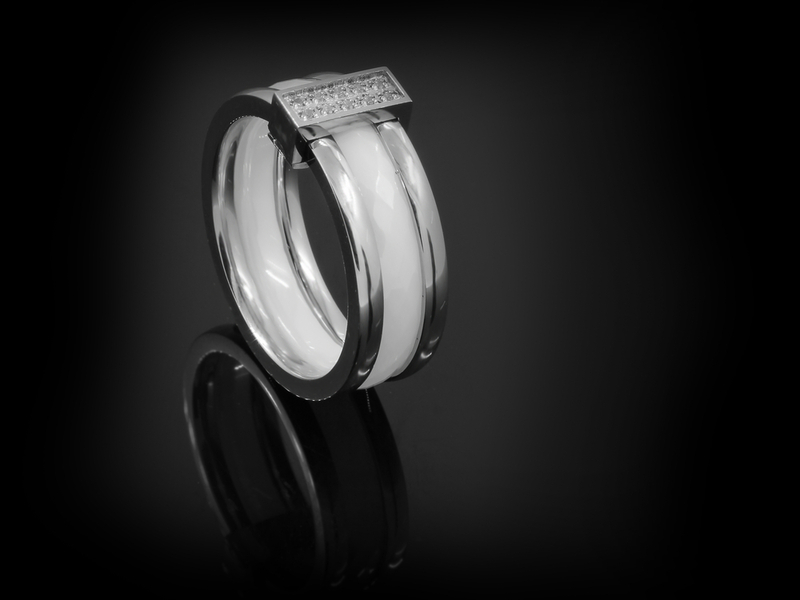 In fact, this metal choice is incredibly durable and can securely hold any gem or diamond you choose. The reason that the metal hasn’t been used for engagement rings is all about appearance and image. Since stainless steel is inexpensive, setting an expensive diamond within a low-cost metal is often seen as a design faux pas. However, choosing a less expensive metal can be a practical choice: what you save on the metal cost, you can spend on a higher quality gem or diamond. If you’re ready to ‘steel’ this engagement look, check out these design ideas for stunning stainless steel engagement rings for him and her! Set a single diamond within a sturdy stainless steel setting for an elegant take on an industrial design. Like most metals, you can opt for engraved details within the steel or you can keep the solitaire setting polished and simple. Brushed steel magnifies the industrial hard-edged look. Choose to add side stones next to a shapely marquise or pear shaped diamond to create a three-stone steel engagement ring. You also can mix and match gems and diamonds for a colorful trio. Stainless steel is incredibly inexpensive. However, if the engagement ring budget is extremely tight, opt for moissanite as the engagement centerpiece. 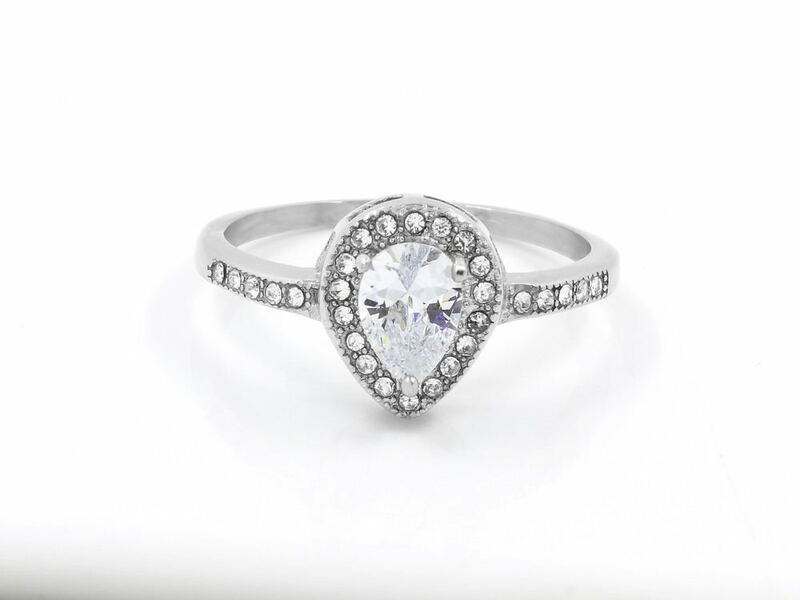 This gem offers the same nearly-colorless look as a diamond with even more fire. Just don’t confuse moissanite with a cubic zirconia, as moissanite is a completely unique gem. 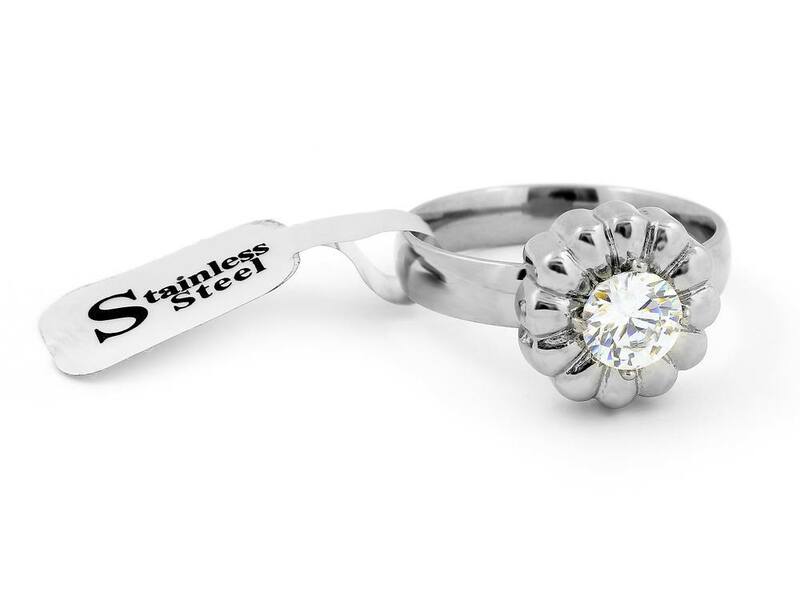 Stainless steel can also be used to create a one-of-a-kind alternative engagement ring. Use nontraditional gemstones as a stunning centerpiece. Choose turquoise, topaz, aquamarine or even alexandrite to design a colorful ring. Use onyx, a jet black pearl or a black diamond for a monochromatic look. A crisp row of small diamonds can be used to create a simple and sleek engagement ring design for him. Or choose a seamless row of color using his favorite gemstone. By grouping small stones into one design, the eye is drawn to an illusion of one larger stone. This is a great alternative for couples on a tight budget. 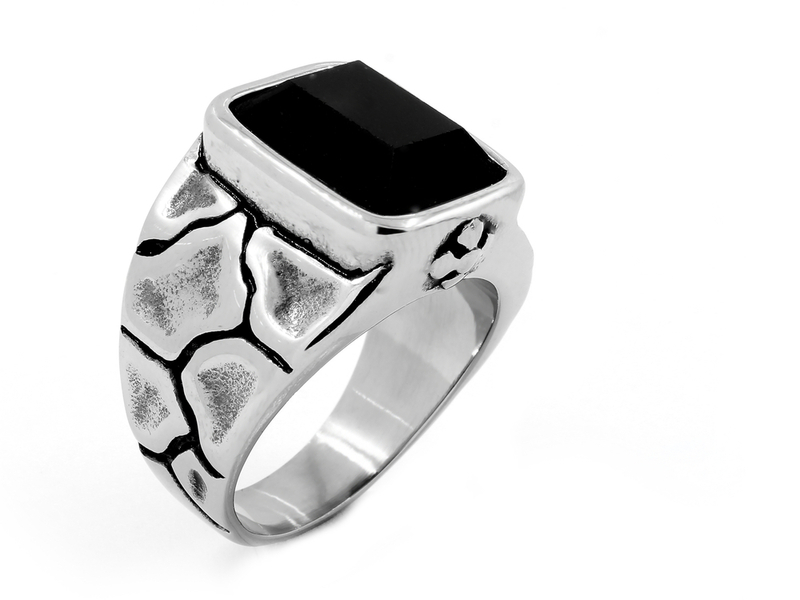 Take inspiration from stainless steel’s industrial roots and choose a funky alternative stone for the central focus of his ring. Amber, carnelian and zoisite are all lesser known minerals that will get his ring noticed! Salt and pepper diamonds are imperfect diamonds, and their name is derived from the obvious crystalline and carbon inclusions found within the structure of the diamond. Since these stones feature a lower clarity grade, they are often priced much lower. However, their imperfections make them in demand as the rough cut look of the diamond creates a rustic appeal. 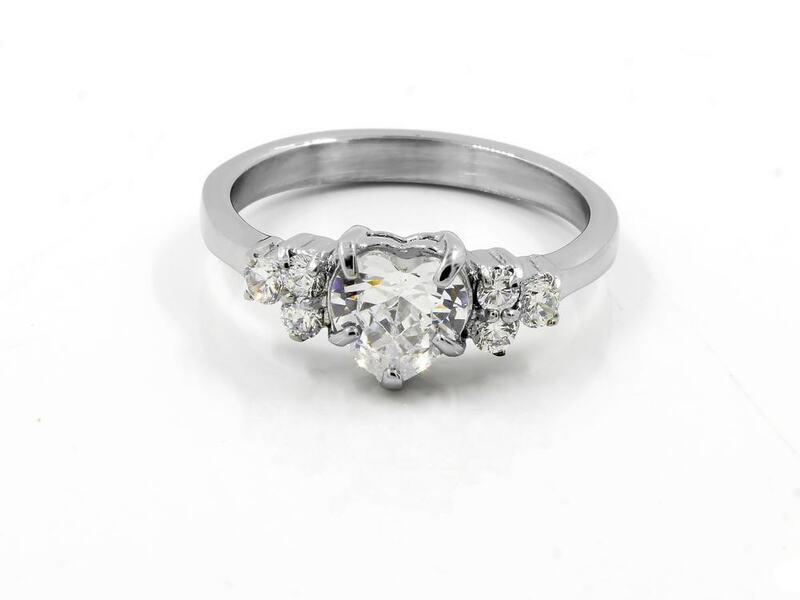 While Brilliance doesn’t sell low clarity stones, you can still request them for a custom ring. When choosing your dream engagement ring, don’t rule out stealing the latest look: stainless steel. This budget-friendly metal offers durability and a low price that allows couples to opt for more expensive center stones or other dreamy details. Stainless steel engagement rings are the ultimate low maintenance metal choice with an elegant touch of industrial Brilliance.